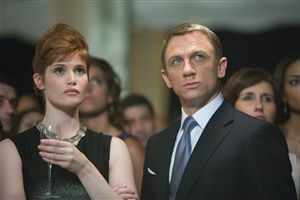 Cast: Daniel Craig, Olga Kurylenko, Judi Dench, Gemma Arterton, Mathieu Amalric, Jeffrey Wright, Giancarlo Giannini. Directed by Marc Forster, written (partly) by Paul Haggis. Story: Bond's out for revenge. It's been hard, but I successfully managed to avoid ALL the publicity for Bond 22, as they always show the best bits and spoil them. Having gone to all that effort, I was expecting rather more from the movie. James Bond is all about action. Make some cracking signature action sequences and you can get away with all kinds of silly plot devices (e.g. Die Another Day, The Transporter). The action scenes here are some of the worst I've ever seen in a Bond film, and that includes both the Timothy Dalton turds. Seemingly trying to copy the Bourne style, they've gone waaaay too far with the jiggly-jumpy-camera style to such an extent that you can't really see what's going on. As soon as you've focused on one shot, it changes. People get whacked, glass gets shattered, but the impression is of a general melee rather than a proper scrap, and it takes all the suspense out. They use the same technique in the car chase too, which is a massive error as it makes the scene discontinuous and thus totally worthless. I expect so much more from Marc Forster, director of Finding Neverland, The Kite Runner, Monster's Ball and Stranger than Fiction. I guess he just can't do action. I also expect much, much more from screenwriter Paul Haggis, who is starting to show hints that Crash was a fluke. Poor show boys, poor show. I haven't even begun to describe the flaws in Quantum of Solace, but I'm going to stop now as it's beginning to depress me. On the drive home I was ready to give it a 3, because it did keep me occupied and the running time did go quickly - however now I come to describe it, it's just not as good as other movies I've given that rating to, so I'm afraid it's slipping to a 2. A big, fat number 2. Testosterone Satisfaction Rating: 3/5 - people get smacked a lot, but it happens so fast and in such a muddle that it could've been Des O'Connor and Julian Clary fighting, I couldn't tell. To enjoy this film: oh I don't know. Slow down time? Quantum of Solace was released in the UK on 31st October 2008.